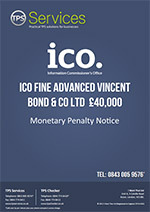 London based Vincent Bond & Co Ltd has been fined £40,000 by the Information Commissioners Office (ICO) for sending unsolicited text messages. Between the period 11th May 2014 and 14th December 2015 Vincent Bond & Co Ltd sent 346,162 text messages via a supplier who was introducing leads to the company. In total, 147 complaints were received equating to £272 per complaint. Vincent Bond Ltd was responsible for ensuring its text messages were being sent to people who had agreed to receive them. It failed to do this and instead, caused frustration, anger and upset. Unwanted texts are an intrusion on people’s lives and it is right that we take action to stop them. And we have. When people complain to us they need to know that it counts. The intelligence they give us helps us trace the unwanted calls or messages to source and gives us a better chance of stopping the nuisance. Employing another company to generate leads for your business, especially by text, does not absolve your business of the responsibility for compliance with the Privacy Electronic Communications Regulations (PECR). Secondly, the issue of “opt-in” or “consent” is something companies are still failing to properly understand and subsequently getting into trouble for. Vincent Bond & Co Ltd are a well-established company and, by all accounts, well respected. This looks very much like a lack of understanding on the laws associated with marketing and this is not a unique situation. New and well established companies alike seem to regularly fall foul of marketing laws. Fundamental to that are the Privacy Electronic Communications Regulations (PECR) and the issues of consent. Consent is something the data industry as a whole is only recently coming to terms with. That is not to say that companies flouting PECR should be let off easy per say, but more needs to be done to educate companies on what they can or cannot do as the data industry has been operating badly for many years no thanks to the ICO.